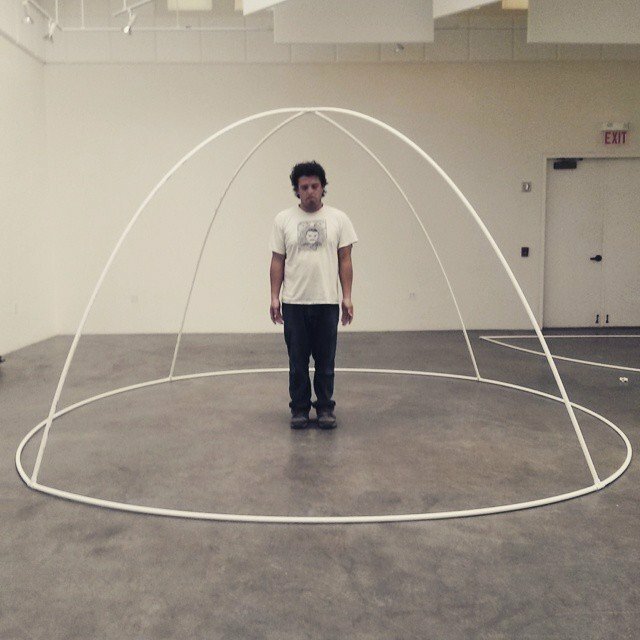 “I’m a Chicano artist from Los Angeles,” Israel F. Haros Lopez—“Iz”—told me. “I’m a multimedia artist, I do visual work, I do music, I do mural work.” He’s currently an artist-in-residence at the Santa Fe Art Institute, focusing on this year’s theme of “Immigration/Emigration.” Iz is also an Emissary from the Future in the USDAC’s #DareToImagine National Action, taking place nationwide from 10-18 October. And he’s taking his role as a catalyst very seriously. “My work is invested in talking to people, waking their artistic sensibilities, giving people the tools to recognize their own potential, to not feel like they don’t have enough skills—to know that art is always something in the people, you don’t have to be a professional artist to make art. It’s directly tied to politics. For me, a lot of work has be in conversation with immigration policies, with local policies, and in some ways about healing but also in finding direct local action and being creative. “#DareToImagine is in direct alignment with how I work. “It sparks the possibility of doing events on a regular basis. For a lot of us in Santa Fe, the intersection between art and politics is hard to find. There’s not a lot of people here engaged in that. This is an art community that is second to New York in art sales, which has a lot to do with tourism, with a very particular art aesthetic. So while there’s a lot of things to do with art, art that’s socially and politically inclined—spaces that work with that type of work—are fewer. So we’re trying to create more spaces. #DareToImagine is the perfect art form to be doing that. When we heard about #DareToImagine, we said let’s try to do as many events as possible to plant the seed, to spark the artistic movement. It definitely sparked people’s imagination, being free to create Imagination Stations. 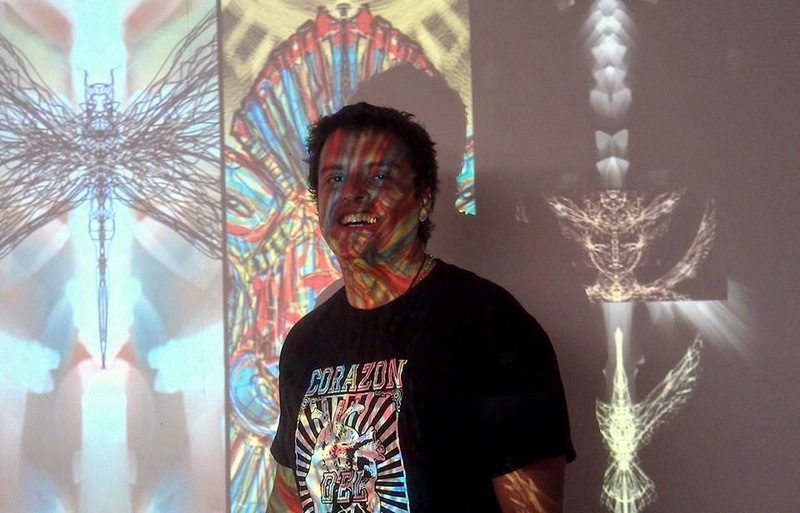 Israel F Haros Lopez behind projected images of his own work. Iz has been in Santa Fe for six years. He grew up in Los Angeles, surrounded by the creations of the Chicano mural movement, then when to school at UC Berkeley. I asked if he was familiar with the mural work of SPARC, whose founder Judy Baca serves on the USDAC National Cabinet as Minister of Sites of Public Memory. Then there’s a second Imagination Station where “people come inside of this giant Olmeca head to imagine what Santa Fe could look like in the future they want.” Plus “someone out in Ribera, New Mexico, is taking the lead on doing #DareToImagine a world without borders, and setting up a watercolor station there. We’re also looking at Indigenous People’s Day, October 12th, and the theme of #DareToImagine Indigenous People’s Day every day, which would be an open-mic art happening. And we’ve got some youth in Santa Fe High School that are doing a whole #DareToImagine around hip-hop, doing rap and breakdancing and making a mural which will actually be on the school site, which is going to be pretty awesome. The giant Olmeca head Imagination Station beginning to take shape. These are just a few of the New Mexico #DareToImagine events planned. Be sure to visit the #DareToImagine website on or after October 10th, when the Action launches, to learn more about the Imagination Stations of New Mexico and others across the country, and to post your own vision of a future you #DareToImagine!